A few days ago, a new billboard advert appeared opposite our office. Initially, I didn’t pay it much attention and it was only when I looked at it more closely that I realised this: I had absolutely no idea what or who it was advertising. 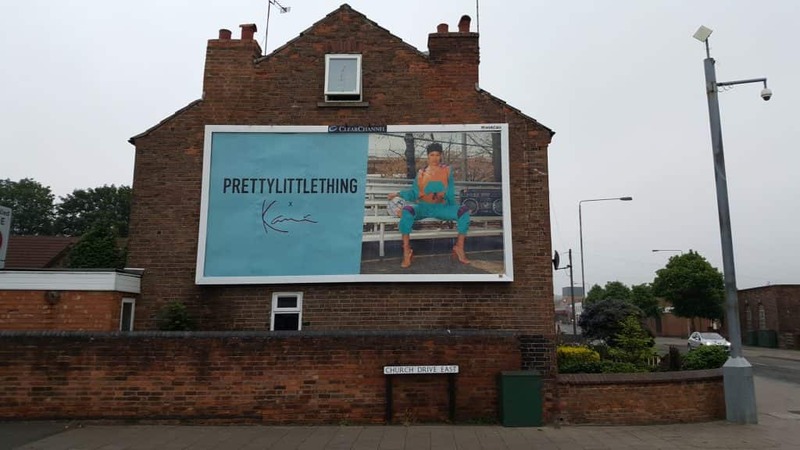 The ad features the words “PRETTYLITTLETHING” in capitals, a small ‘x’, an unintelligible signature, and a photo of a model in what looks like some sort of Dash-esque shellsuit (showing my age, there). At first, I assumed that the words were the strapline of a fashion range launched by one of those modern-day celebs who are Internet-famous without people of my age having a clue who they are. I assumed the signature was of the celeb, who may or may not have been the woman in the picture. (Incidentally, what do you think of the pose? It’s pretty provocative, which has raised an eyebrow or two with some of my colleagues). Considering I could only really make out the capital K, I idly wondered whether it was one of the Kardashians. The sum total of my knowledge of the Kardashians is that they have a lot of first names that begin with a ‘K’, and this seemed to tick that box. It’s not them, and at this point I appreciate that I sound like someone’s grandad. So, being a gentleman of a certain age, I asked a (much) younger colleague to also take a look. Could they tell me a) who the poster was advertising b) who the signature belonged to and c) who the woman was? It transpires that my younger colleague knew that Pretty Little Thing was a clothing brand. Win! However, they had no idea who the signature or the woman was, and so we had to head online to find out more. A cursory search shows that yes, Pretty Little Thing is a clothing brand. It turns out that the signature belongs to Karl Kani (no, still none the wiser). Apparently the woman in the picture is Teyana Taylor (again, still none the wiser). Now. If I were the sort of person who is interested in taking my look ‘all the way up’ (whatever that means) then it’s quite possible that this advert talks to me, and that I know exactly what it is saying. The target audience for 90s-inspired streetwear might be all over this billboard and it might be doing an amazing job. Surely the basic purpose of an advert ought to be to clearly identify the advertiser and what they’re selling? In this case, even a ‘.com’ after the brand would have told me who the advertiser was. Writing Karl Kani’s name would have told me who the signature was (even if I’d never heard of him). Or, is the fact that a forty-something gent has no idea what is going on precisely the point? Are Pretty Little Thing deliberately only talking to their own customers? (quite how many of these frequent a working men’s club is another question altogether). Perhaps the problem is that I owned a ghetto blaster like that back in 1988, and I am sure I saw designs like that a quarter of a century ago. Still, that’s hardly Pretty Little Thing’s fault, is it? Good ad? Or bad ad? And what on earth is the ‘x’ for?